On Monday, 2 July 2018, four LL.M. 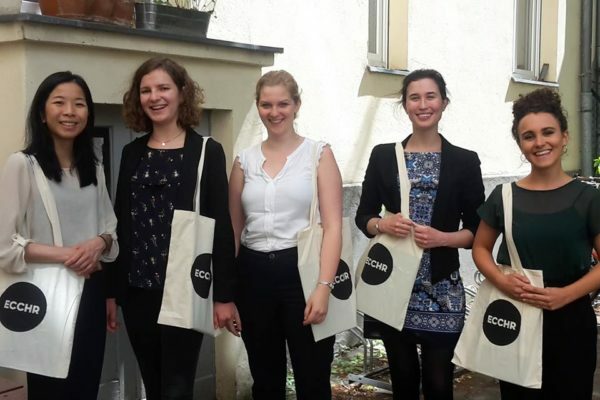 students of one of our IHL Clinic teams, along with their supervisor, travelled to Berlin for the purpose of presenting their research and report on a particular project to a KGF cooperation partner – the European Center for Constitutional and Human Rights (ECCHR). The team had diligently collaborated over several months to carry out this research in the fields of IHL and international criminal law. The team consists of LL.M. students Ms. Joyce Man, Ms. Monika Tobjasz, Ms. Frauke Maas and Ms. Caitlin Fitzgerald. The supervision of the project was undertaken by KGF Guest Researcher Ms. Kaetlin Gale LL.M. and Dr. Joseph Powderly. The IHL Clinic is directed by Dr. Robert Heinsch.